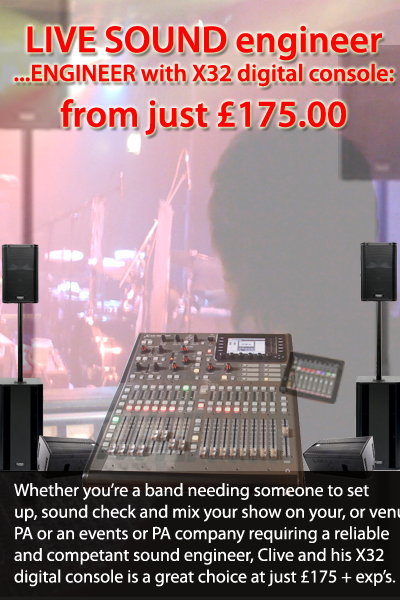 Clive Sound: PA, Sound, DJ & disco equipment hire in Kent, London & SE. 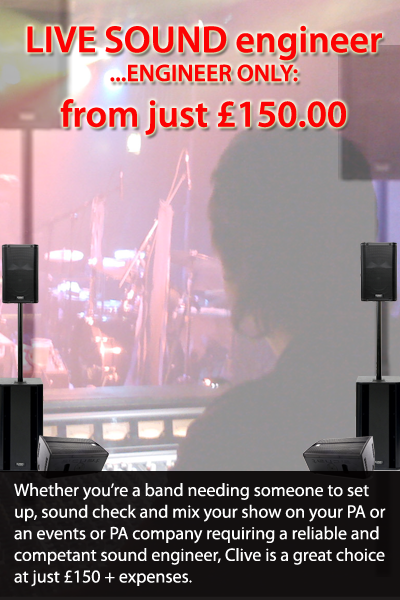 CLive Sound for high quality, low cost PA solutions with the personal touch. Book before 22nd April and get an effect light or smoke machine for FREE - worth a whopping £10.00. I know I'm so generous although let's not go mad there's limited availablity so first come first served. Book before 30th April and get a professional set-up on all 4+ speaker hires. This is worth at least £30.00. Pro set up means I take on all cable routing, taping down and full health and safety assessment of the work carried out - i.e. I make sure you're happy with my work. Clive Gregory runs through the features of the Midas powered Behringer X32 Producer digital console. This console is used by Clive on all his engineered gigs. ENGINNER with X32 digital console £185+exp. 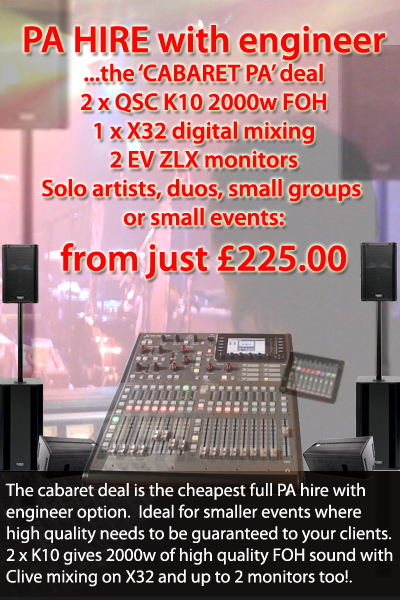 FULL PA HIRE with ENGINNER CABARET PACKAGE from £225+exp. 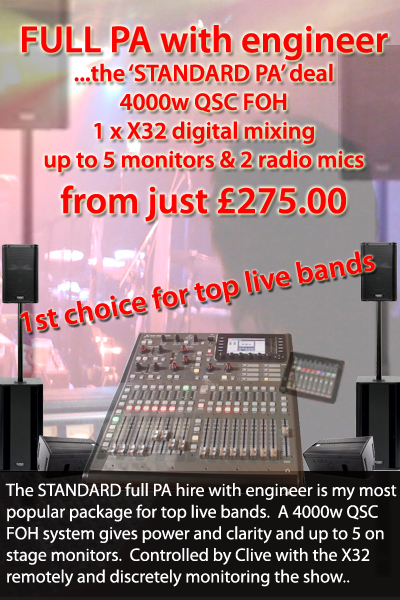 FULL PA HIRE with ENGINNER STANDARD PACKAGE from £295+exp. 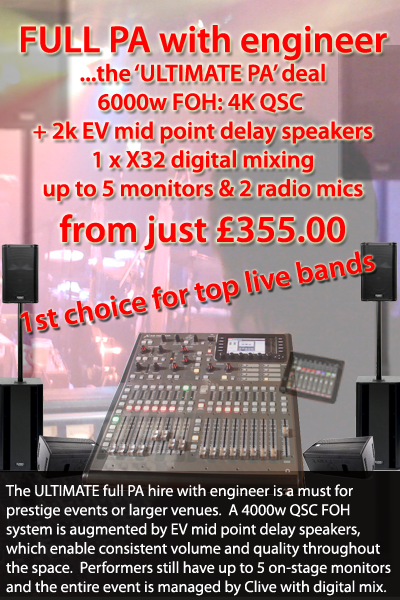 FULL PA HIRE with ENGINNER ULTIMATE PACKAGE from £375+exp.